A tight-knit, single-family community in a fabulous location – what more could you ask for in beautiful Naples? Carlton Lakes epitomizes the vacation lifestyle that Southwest Florida is so famous for, creating a unity between the beautifully designed homes and the surrounding natural landscaping. The location is well-regarded as being one of the most desirable in the city, as you’ll be just around the corner from the convenience of I-75, as well as a few short miles from the famed Naples beaches, shopping, and dining. Plus, the on-site amenities at Carlton Lakes are among the most fun and comprehensive of any neighborhood, including a massive Social Center, world-class fitness center, and much more. The property at Carlton Lakes is made up of dense trees, 40 acres of natural preserves, sparkling lakes, and countless walking trails that provide the perfect setting for a sunset stroll. The shaded streets remain cool even during summer, and the 30 fountains that adorn the 50 acres of lakes throughout the community are wonderfully picturesque. And, with multiple unique combinations of home designs and floor plans to choose from, you can take control of finding your dream home within the attractive borders of Carlton Lakes. Carriage homes, garden homes, single-family homes, and luxurious villas are all available at Carlton Lakes, giving this tropical community an unprecedented number of living options. If you’re looking for something small and intimate, look no further than the beautiful carriage homes – 2 bedroom, 2 bath residences with fewer than 2,000 square feet and intricate designs throughout that echo classic Florida charm and warmth. Plus, they can come unfurnished, partly furnished, or fully furnished, so you can choose exactly what plan works best for your needs. The single-family homes are larger, and just as exquisite. Take a look at a stunning, 4 bedroom, 3 baths masterpiece that rests on 2,556 square feet and boasts a classic Mediterranean design mixed with modern charm. You’ll also love the cozy nature of a 3 bedroom, 2 bath home on just 1,671 square feet that has an attached, two-car garage, tall trees shading the property, and lush vegetation throughout the lawn. In Carlton Lakes, you’re getting a magnificent living experience that absorbs all that is wonderful about the homes, the community, the friends, and the unmatched Naples scenery. Between the pools, the tennis, the exercise, and the neighborly card and board games, Carlton Lakes has everything needed to bring a community, the people, together for fun. After a long day, enjoy relaxing in one of Carlton Lakes’ 9 heated satellite pools, each with a share of private cabanas to take a much-deserved nap under. Or, head over to the state-of-the-art fitness center to run, lift some weights, or clear your mind through yoga. And if tennis is your passion, you’ll “love” the four lighted, hydrocourt tennis courts – the perfect place for a tournament among the residents, or just a casual and fun game amongst friends. Plus, living in Carlton Lakes puts all of Naples’ most attractive amenities right outside your backyard. Just a 5 minute trip down the road are the beaches that make the city famous, including the incredible Delnor-Wiggins State Park and Beach, home to boating, fishing, swimming, and more. The park holds beautiful and natural mangrove preserves, lush scenery, and breathtaking Gulf views, as well as designated areas for all the water activities you can think of. And ask anyone in the city – nothing beats the sight of the vast horizon with a stunning Southwest Florida sunset as a backdrop. You’ll be right in the heart of North Naples living in Carlton Lakes, just minutes from all the fabulous shopping and dining options the city has to offer, such as the beautiful Mercato shopping center. You’ll be just around the corner from Florida’s stunning Gulf coast. And you’ll be living in a home that emphasizes, comfort, luxury, quality, and affordability. 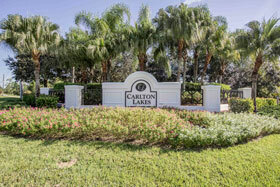 In all, Carlton Lakes is the pinnacle of a tropical, vacation-like experience in Naples.